The letter from Gov. Brown’s office in California is the latest in a slew of comments from the coasts arguing for locally generated renewable energy rather than importing renewable power over a large-scale network of transmission lines from the interior. Nine of the 10 Eastern states whose governors signed the May 2009 letter could get over 80 percent of their electricity from in-state renewable resources, according to the Energy Self-Reliant States report (map below). The Southeast United States is the only region where wind and solar power are limited. But even so, every state could get at least 20% of its electricity from in-state renewable energy. Renewable energy imports may be necessary, but not for many years. 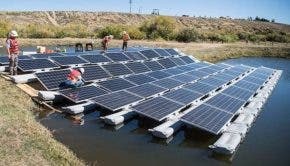 Many wind and solar developers may like the low-cost profile of wind in the Mountain West or Midwest and solar in the sunny Southwest, but their plans to ship that power to the Coasts via new high-voltage power lines built at ratepayer expense may run afoul of their prospective customers.